One of the powerful features of Reel-Scout™ version 10 is the ability to find places quickly that meet the location scout’s criteria. Select Locations in the menu bar on the left-hand side of the screen. The Locations menu will default to the Browse option. To search for places that meet your requirements, click Search. In the Search Locations screen, type in your search criteria. This search page allows you to enter many different search parameters through either drop-down menu or free-form text. When you select a search parameter box, the box becomes outlined in blue for ease of orientation. To activate a search, use the “enter” key on your keyboard or click Search at the bottom of the screen. Once you’ve clicked search, you will be taken to a Browse page that includes the results of your search. Location Name is a free-form field in which you can enter the name a location, in whole or in part. As an example, entering the letters “tre” would return search results whose location names all contained that letter combination.At the top of the screen, you will see a summary of your search criteria in blue letters. The “X” next to your search criteria can be clicked to erase your search and return you to the Browse page. Category searches make finding locations easy because the results are standardized and highly specific. Clicking on the Category window will reveal a drop-down menu of choices. Alternatively, you may begin typing, and matching categories will appear as you add letters. You can add as many categories and sub-categories as you wish. 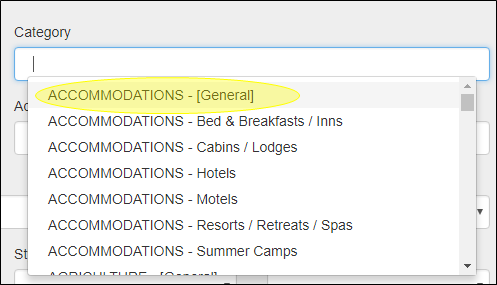 If you’re looking for all locations in the main category, regardless of subcategory, select the main category-[general]. For example, ACCOMMODATIONS – [General]. Location ID and Photo ID are also free-form fields. However, you must know the exact ID number of the item for which you are searching. Address is a free-form search field. Results will include all locations whose Address1 or Address2 fields match the search criteria. The Region, County, and City/Town search fields are drop-down search fields. You may only select one search criteria in each field. Within Zip Code is a single-select field that allows the user to select from .5, 5 or 10 miles from the US-based zip code that they enter. Style is a single-select search field that defines the architectural period or style that is attributed to a location. Keyword is a single-select dropdown search option. Only one main keyword-specific search can be conducted at a time. These values can be customized by the film office. These are also free-form fields. They require exact character searching. Permitting Bodies is a single-select dropdown search option. Only one jurisdiction can be selected at a time. This list can be customized by the film office. This search function allows the user to pull all records modified by a specific user over a date range or period. 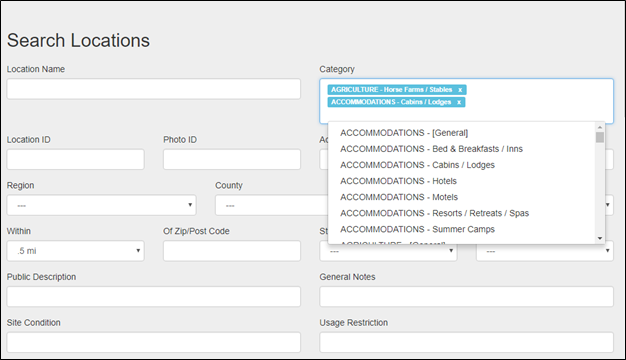 The Last Modified By and Created By fields feature a drop-down menu of all of the users authorized to make changes in the system. This function is especially useful when creating a package for a client in which you want only those location files that have photos. 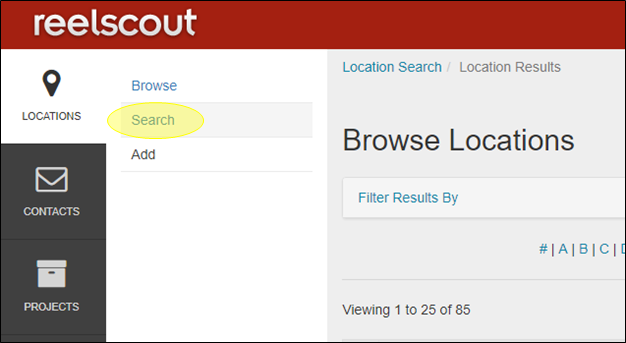 Clicking Filter Results By will open up the below screen to enable you to refine your search results. At any time, you can click Search in the sub-navigation pane on the left-hand side of your screen to begin a new search.